Lavender Sandalwood Calming Body Cream combines the soothing scent of lavender with the velvety warmth of sandalwood to settle the mind and instill a sense of comfort and peace. Formulation: Extracts of melissa and wood sorrel balance skin while precious oils from macadamia nut, apricot kernel and avocado fortify the skin. Quince seed extract, sunflower and olive oils replenish for smooth, supple and protected skin. I adore the Dr. Hauschka Team!!! Smell is not overpowering, just right. Out of all the lotions, this is my favorite. I use nightly on hands before bed. Not greasy and not waxy, hooray. I love lavender and am just not in love with this fragrance combination. I am a huge Dr Hauschka fan and thought I'd this, but I won't buy this again. The fragrance improves a bit after you apply. 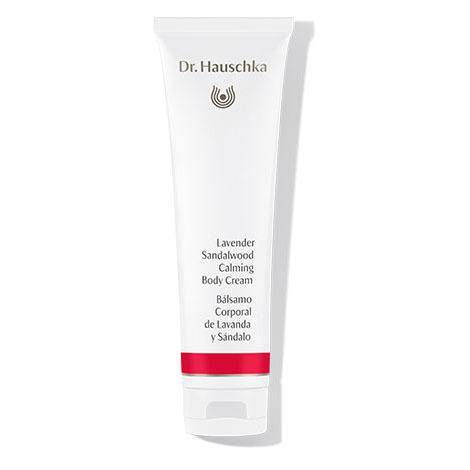 Been using Lavender Sandalwood cream from Dr. Hauschka for many years and I absolutely love it. All of Dr. Hauschka's products are stellar amazing. This product has left the skin on the back of my arms soft and smooth. No other moisturizer was able to accomplish this. I recommend it highly. Non greasy and absorbs into slim quickly. Smells very nice - the fragrance softens delicately. I would recommend this product for anyone that wishes to soothe and balance their body. The scent is so wonderful and the feel of my skin after moisturizing with this cream is amazing. I use this cream at night and the scent is pleasingly light and not over-powering, very natural-smelling. I don't put anything on my body that is not natural and it's nice knowing all the ingredients are from plants and put together conscientiously and naturally. Thank you for a great product. It moisturize the skin without leaving it oily. The skin will be moist and supple. Such a wonderful smelling and feeling lotion. I use it before bed and it is very calming. This is very hydrating especially on my legs. However, this aroma reminds me of sandalwood incense. It's used for relaxing but I prefer more flora scents. I wish they sold this by the gallon! It works wonders on dry patches and is heaven anywhere else. You can't go wrong with this if you are looking for a natural calming cream. I love this lotion, either alone or after applying some of the Moor Lavender Body Oil after a shower. I keep this next to my bed and put some on before going to sleep. I find the relaxing smell just helps me relax. A strong puppy I have raised for the last year and a half, an action dog, accelerated from a stop basically so fast strong and hard that the nylon lead gave my hand a rope burn between my ring and little finger. Nobody needs to experience this. I have only learned about these kinds of burns from him. They are devastating to dermal tissue. My ankle bracelet of scars is proof. Learning as I go I wanted to use sandalwood & myrrh with an oil to help the deep layers burned off, better than the last time it happened. Enter arrival of a sample of the Lavender Sandalwood cream. If you want to see how well something works, a test on something as damaged as that tender area at the base of two fingers is a test. Instantly I could feel and see the relief and hope it provided. I ordered the tube immediately and a month later, I am free from scarring. all layers healed pink and strong. Well, okay, still a little pink but nothing like the brown ugly scars from the previous time. To say puppy is a handful is literal as well as figurative. Give him another year and he will be the head of the household. I have used this lotion daily for years. The formula is impeccable and the fragrance divine. The Lavender Sandalwood Calming Body Cream is my routine skin moisturizer. The lavender scent, combined with the sandalwood offers a soothing and soft fragrance. the texture is perfect for overnight use as it is a bit thicker than my daily skin moisturizer, the Lemon Lemongrass Vitalizing Body Milk. Overall, this is a great product and my skin not only feels better, it looks healthy! I love this product! Have purchased it several times. It leaves the skin soft and the s ent is wonderful. Good moisturizer. Loved the smell. I don't think it moisturizes enough for me though. I have really dry skin and typically need a body butter to moisturize my skin well. Wonderful body cream. Relaxing and calming scent. Loved the scent and how my skin felt so nice & soft the next morning even. I highly recommend this product. It does what it says it does: Clams and hydrates the skin. Trust me this is the best body/hand cream ever! I love this product. I have very sensitive hands and this newer product is the best at soothing and caring for my hands, feet or entire body. It is a heavier cream than the Dr. H body milks--the body milks have an easier application on the body. The scent is heavenly and very relaxing at night when you want to sleep. To seal moisture into your skin, apply Moor Lavender Calming Body Oil over the moisturizer.